To Cite: Ali Abdel Rahim K A, Mohamed Ali Mohamed A. Prevalence of Extended Spectrum β-lactamase-Producing Klebsiella pneumoniae in Clinical Isolates, Jundishapur J Microbiol. 2014 ; 7(11):e17114. doi: 10.5812/jjm.17114. Background: Extended spectrum β-lactamase (ESBL) are gram-negative bacteria that produce the enzyme, β-lactamase, which can break down commonly used antibiotics, such as penicillin and cephalosporins, making infections with ESBL producing bacteria more difficult to treat. Extended spectrum β-lactamase-producing Klebsiella pneumoniae were first reported in 1983 from Germany, and since then a steady increase in resistance against cephalosporins has been seen causing health problems. Objectives: The aim of this study was to determine the prevalence of ESBL in strains of K. pneumoniae isolated from different clinical samples. Patients and Methods: One hundred and thirty isolates of K. pneumoniae were isolated from different clinical specimens from King Khalid hospital, Hafr Elbatin, Kingdom Saudi Arabia. These isolates were then characterized, tested for antimicrobial susceptibility and screened for ESBL production by the MicroScan WalkAway-96 SI System. Extended spectrum β-lactamase production was confirmed by the phenotypic confirmatory disc diffusion test (PCDDT) and the double disc synergy test (DDST). Results: Overall, 76.9% (100) of the isolates were resistant to cefuroxime, cefepime and cefazolin, 69.23% (90) were resistant to cefotaxime, and 46.15% (60) were resistant to cefoxitin. Extended spectrum β-lactamase was detected in 53.8% (70) of K. pneumoniae as detected by the MicroScan “WalkAway-96” SI System and 50.07% (66) by PCDDT and 46.15% (60) by DDST. All K. pneumoniae isolates were resistant to ampicillin followed by both piperacillin and mezlocillin 92.30% (120). K.pneumoniae isolates showed high sensitivity to imipenem (15.38%) (20), followed by ertapenem, tetracycline, tigecycline pipracilline/tazobactam and amikacin (23.07%) (30). Conclusions: Our study showed that the prevalence of ESBL-producing K. pneumoniae at King Khalid Hospital was significantly high. Routine detection of ESBL-producing microorganisms is required by each of the laboratory standard detection methods to control the spread of these infections and allow a proper therapeutic strategy. For detection, the phenotypic confirmatory disc diffusion test is simple, sensitive and cost effective. However, there is a need for larger scale drug susceptibility surveillance. The wide spread use of antibiotics in hospitals has led to the emergence of multidrug resistant organisms of low virulence like Klebsiella causing serious opportunistic infections. Over the last 15 years numerous outbreaks of infection with organisms producing extended spectrum b-lactamases (ESBLs) have been observed worldwide (1). The advent of ESBL producers has posed a great threat to the use of many classes of antibiotics particularly cephalosporins. There are indications that poor outcome occurs when patients with serious infections due to ESBL-producing organisms are treated with antibiotics to which the organism is resistant (2). Extended spectrum b-lactamases-producing Klebsiella pneumoniae were first reported in 1983 from Germany, since then a steady increase in resistance against cephalosporins has been seen. These ESBLs are encoded by transferable conjugative plasmids which also quite often code resistant determinants to other antibiotics (3). An ESBL variant may be selected de novo in a given hospital or it may be introduced from another center. Its further spread within the hospital can be the consequence of plasmid transmission. Persistence and outbreaks of ESBL producers have been convincingly correlated with extensive use of cephalosporins (4). The enzyme β-lactamases continue to be the leading cause of resistance to beta lactam antibiotics in gram-negative bacteria. In the recent years there has been an increased incidence and prevalence of ESBLs, enzymes that hydrolyze and cause resistance to oxyimino-cephalosporins and aztreonam (5). Extended spectrum b-lactamases and AmpC β-lactamases are of increasing clinical concern. These ESBLs are most commonly produced by Klebsiella species but may also occur in other gram-negative bacteria. They are typically plasmid mediated, clavulanate susceptible enzymes that hydrolyze penicillins, extended spectrum cephalosporins (cefotaxime, ceftriaxone, ceftazidime, cefepime and others) and aztreonam (6). The most common method of testing for extended spectrum β-lactamases is screening for reduced susceptibility to cefotaxime, ceftazidime, ceftriaxone and cefpodoxime followed by a phenotypic confirmatory test that demonstrates a synergistic effect between an indicator cephalosporin and β-lactamases inhibitor that is clavulanic acid (7, 8). The sensitivity of screening for ESBLs can vary depending on the type of the antimicrobial agent tested (9-11) according to Clinical Laboratory Standard Institute (CLSI) M100-S13 guidelines (10). The present study firstly aimed to evaluate the extent of prevalence of ESBL-producing K. pneumoniae in different clinical specimens from King Khalid Hospital (Hafr Elbatin, KSA) and to determine the antibiotic resistance profile of these specimens. Secondly. this study aimed to highlight the need for drug susceptibility surveillance to control the spread of drug resistant infections as well as the need for proper therapeutic strategies and ESBL confirmatory tests such as phenotypic confirmatory disc diffusion test (PCDDT) and double disc synergy test (DDST). This study was carried out at the microbiology laboratory of the Department of Clinical Analysis at King Khalid hospital, Hafr Elbatin, Kingdom Saudi Arabia. Mid-stream urine, suction tip, pus, and blood specimens were collected aseptically for bacteriological examination from March 2012 to November 2013. Handling, transportation and storing of collected samples were done at refrigeration temperature. All samples were inoculated on MacConkey’s and blood agar (Oxoid Ltd, Bashingstone, Ham-pire, and UK) and incubated at 37 ◦C overnight for colony formation. Blood samples were inoculated in brain heart infusion broth (Oxoid Ltd, Bashingstone, Ham-pire, UK) followed by incubation at 37◦C overnight, and then, a drop was inoculated on MacConkey and blood agar and incubated at 37◦C and observed for seven days and if no growth appeared on the blood sample, the results was considered as negative. Colonies that appeared during these seven days, were sub cultured; K. pneumoniae isolates obtained as a pure and predominant growth from the clinical specimens were only considered for the present study, but mixed growing cultures were excluded. The MicroScan WalkAway-96 SI (Siemens Healthcare Diagnostics Inc. USA) automated system was used for the laboratory identification. Antimicrobial susceptibility testing was performed with Neg/BP/Combo 30-B1017-306E combination panels (Siemens Healthcare Diagnostics Inc, USA). All procedures were performed according to the manufacturer’s directions. The integrated Lab-Pro version 1.12 (Siemens Healthcare Diagnostics Inc, USA) that includes the Alert expert system uses growth in the presence of cefpodoxime (4 µg/mL) and ceftazidime (1 µg/mL), at concentrations recommended by the CLSI for ESBL screening (10), as primary indicators for possible ESBL production. Minimum inhibitory concentrations (MICs) obtained for ceftriaxone, cefotaxime and aztreonam are interpreted according to CLSI breakpoints (11), and MIC results may also serve as primary indicator or alert for ESBL production. Screening with this system is limited to E. coli, K. pneumoniae and K. oxytoca, i.e. species that are primarily dealt with in the CLSI guideline. The isolated colonies were inoculated in peptone water at 37◦C for 2-6 hours. The turbidity was adjusted to 0.5 McFarland standard and lawn culture was made on Mueller-Hinton agar (Oxoid Ltd, Bashingstone, Ham-pire, and UK) using a sterile swab. Augmentin disc (20/10 μg) was placed in the center of the plate. Both sides of the augmentin disc, a disc of cefotaxime (30 μg) and ceftazidime (30 μg) (Oxoid Ltd, Bashingstone, Ham-pire, UK) were placed with center to center distance of 15 mm to the centrally placed disc. The plate was incubated at 37◦C overnight. Extended spectrum b-lactamases production was inferred when inhibition zone of the 3-rd generation cephalosporin disc was increased towards the Augmentin disc, or when single antibiotic disc was not inhibitory but inhibitory in case of the two antibiotics were combined . In our study, we analyzed 130 K. pneumoniae strains isolated from different clinical specimens; 40 from pus, 40 from urine, 40 from blood and 10 from suction tip, during the period between Mars 2012 and November 2013 (Table 1). In total, 130 isolates of K. pneumoniae were tested for their antibiogram activity; K. pneumoniae was fully resistant to ampicilline followed by mezocillin and pipracillin (92.3%) and highly resistant to cefazolin (76.92%), cefepime and cefuroxime followed by cefotaxime (69.23%). K. pneumoniae showed high sensitivity to imipenem (84.61%) followed by ertapenem, pipracilline/tazobactume, tetraccyclin and tigecycline 69.23% (Table 2). One hundred thirty clinical isolates of K. pneumoniae, were screened for ESBL production according to CLSI guidelines; 70 (53.8%) isolates were positive. These samples were distributed along clinical specimens; suction tip specimens showed 100% ESBL production and isolates from other specimens showed 50% ESBL production. These isolates were selected for conformational tests of ESBL. Two techniques were used in the present study to confirm ESBL-producing K.pneumoniae, namely, DDST and PCDDT. The results showed that from 70 K. pneumoniae isolates, 60 isolates were positive by DDST (85%), while 66 were positive by PCDDT (94%) (Figure 1). 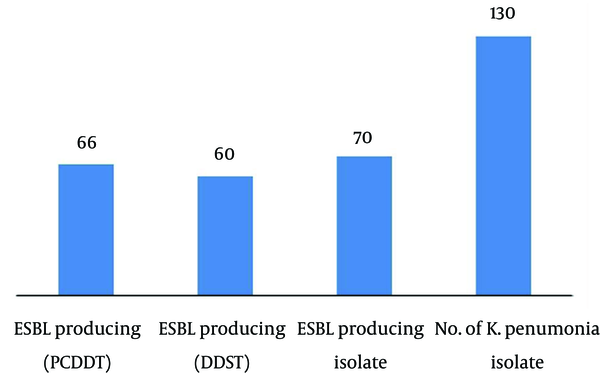 The DDST failed to detect ESBL in six isolates, which showed ESBL production by PCDDT. There is no instance of DDST positive and PCDDT-negative ESBL producers. This indicates that PCDDT is more sensitive in detecting ESBL production than DDST. Many researchers have examined the prevalence of ESBL producing K. pneumonia, for example, in India; high prevalence of ESBL-producing K. pneumoniae strains has been reported by various groups. In our study, the prevalence of ESBL producing K. pneumonia was 53.84%, whereas the percentage of ESBL-producing organisms ranged from 4% to 83% in India (12, 13). Rodrigues et al. (14) reported a lower prevalence for ESBL producers in Maharastra. They reported that four isolates (8.5%) were positive ESBL-producers among 47 K. pneumoniae isolates. This ratio probably reflects the emerging phase of ESBL production, which by now should have increased at the same location. This is understandable since the prevalence of ESBL producers in any hospital depends upon various factors such antibiotic policy, the carriage rate among the hospital personal, and the type of disinfectant used especially in the ICU (15). Some authors feel that ESBL screening is not likely to affect patient outcome and hence is neither necessary nor cost effective for laboratories. They also observed good clinical outcome with cephalosporins for treatment of infections with ESBL-producing organisms. This is an argument against routine screening for ESBL production (16, 17). In the present study, the highest percentage of ESBL was reported from suction tip (100%) followed by, blood, urine, and pus samples (50% as shown in Table 1). A total of seven blood samples were processed from septicemic patients and 57.14% of samples were reported to have ESBL strains of K. pneumoniae. Recently, similar reports have been presented by Gupta et al. (18). In the recent years, a significant increase in ESBL-producing Klebsiella spp., was also reported from the USA (42-44%), Canada (4.9%) (19), Spain (20.8%) (20), Taiwan (28.4%) (21), Turkey (78.6%) (22), Algeria (20%) (23) and China (51%) (24). Focusing on the epidemiology in Europe, there are considerable geographical differences in the occurrence of ESBLs. A recent survey of 1610 Escherichia coli and 785 K. pneumoniae isolates from 31 centers in 10 European countries found that, the prevalence of ESBL of these organisms ranged from as low as 1.5% in Germany to as high as 39-47% in Russia, Poland and Turkey (25). This study demonstrated that the PCDDT was more sensitive for detecting ESBL than DDST, since it, detected 46.15% of ESBL, whereas PCDDT detected 50.76% of ESBL producers. Presence of ESBLs can be masked by the expression of AmpC β-lactamase, which can be generated by chromosomal plasmid genes. Of the 384 clinical isolates of K. pneumoniae, 101 randomly selected isolates were screened for ESBL production by DDST and PCDDT. Of these 79 out of 101 isolates were found to be ESBL positive and 22 were ESBL negative, whereas, Duttaroy et al. from Gujarat India in 2005 reported 58% prevalence for ESBL producing K. pneumoniae, isolated from different clinical specimens using DDST (26). Our study showed high prevalence of ESBL producing K. pneumoniae in suction tip specimens followed by urine, wound and blood specimens. Babypadmini et al. reported 40% prevalence for ESBL producing K. pneumoniae, in urinary isolates in Coimbatore, India in 2004 (27). A total of seven blood samples were processed from septicemic patients and it was reported that 57.14% of samples had ESBL strains of K. pneumoniae. Similar reports have been presented recently by Gupta et al. (18): In Chandigarh a total of thirteen blood samples were processed from septicemia patients and 69.2% of samples were reported to have ESBL K. pneumoniae strains (15). Our study highlights discouraging results of antimicrobial therapy. Keeping in mind the high prevalence of ESBL producing K. pneumoniae in King Khalid Hospital (Hafr Elbatin KSA), it is extremely important to screen ESBL producing microorganisms to control the spread of these infections and also to achieve a proper therapeutic strategy. For detection, the phenotypic confirmatory disc diffusion test is simple, sensitive and cost effective. There is a need for larger scale drug susceptibility surveillance. The authors extend their appreciation to the Deanship of Scientific Research at King Saud University for funding this work through research group no. RG - 1435 - 060. Authors’ Contributions: Fortes, Khalid Abdel Rahim: analysis and interpretation of data. Ahmed M. Ali: drafting of the manuscript. Ahmed M. Ali: critical revision of the manuscript for important intellectual content. Funding/Support: This work was supported by the Deanship of Scientific Research at King Saud University (research group no RG - 1435 -060).The funding organizations are public and educational institutions and had no role in the design and conduct of the study, collection, management and analysis of the data or preparation, review, and approval of the manuscript.